Ivory Rectangular Treasure Box  - $22.00 : Yarn Tree, Your wholesale source for cross stitch supplies. Item 4546. Antiqued Ivory Rectangular Treasure Box. Display your needlework in a pretty box! Boxes with a picture frame style opening for needlework. 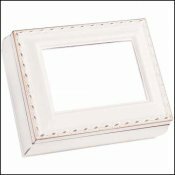 Rectangle boxes measure 3 5/8”x 4½”x 1 7/8” with a design size of 2”x 2 7/8.”Comes with glass to cover your design and a backing board. Clips hold your needlework in the lid. Use your own thin mounting board or simply cut your work to fit. Edges will be hidden. Comes in a gift box.